Roses have captured the hearts of gardeners for centuries. Throughout recorded history, people have been growing roses. They have been symbols of love, beauty, war, and politics. During the Roman period, roses were used as confetti at celebrations, for medicinal purposes, and as a source of perfume. Roses were in such high demand during the seventeenth century that royalty considered roses or rose water as legal tender, and they were often used as barter and for payments. No other plant has such a rich and extensive history. In fact, according to fossil records, the rose is 35 million years old. The popularity of roses continues on today, with more than 2,000 different varieties to choose from. New varieties with increased disease resistance and winter hardiness make roses an excellent choice for shrub borders and perennial gardens, alike. From old classics like tea roses, shrub roses and old garden roses to climbers, miniatures, and the ever-popular Knock-Out series of roses, we have all your favorites at Garden Supply Co.
Mark your calendars and plan to join us on Saturday, March 2nd for our Annual Spring Garden Party! Not only are we rejoicing in the arrival of our favorite season, but we are also marking our 15th fabulous year here at the garden center! So we have lots of reasons to celebrate this spring! The festivities will be going on all day. Here's a line-up of what we have in store for you. 5 minute "snapshot" designs with our professional landscape designers. This is it. Just one more day until Valentine's Day. And for those of you looking for something a bit unique and special for your sweeties this year, we have tons of fabulous last minute gift ideas for you! Now we all know that flowers are the number one gift for Valentine's Day, and at Garden Supply Co., we have flowers! This year, why not give your loved ones flowers that last? Our Greenhouse is literally bursting with beautiful live plants in every shape, size, and color. We have all your favorites like Cyclamen, Hyacinths, Daisies, and Violets, to more rare and exotic beauties, like Orchids. And of course everyone loves roses for Valentine's Day. Here's more peeks at just a few of our stunning blooming plants. And for that extra added touch, we have lots of fun metal flower stakes to dress up your pots. Like this little charmer. Besides flowers, we have many unique and beautiful gift items in the Greenhouse, including these sweet frames. This is truly just a small sampling of the beautiful Valentine ideas you will find in the Garden Center. And don't forget that we offer free gift wrapping and gift cards, too! Happy Valentine's Day to all of you from all of us at Garden Supply Co! Our 1st Annual Evening in the Garden: a PINK Garden Party to benefit Susan G. Komen NC Triangle Affliliate last night was a HUGE success! Our heartfelt thanks to everyone who helped make this evening possible. Thanks to Chef Mario for the delicious food, Paco Band for the amazing music, all the Garden Supply Co. staff and volunteers who helped make this evening a beautiful night to remember. But most of all, a giant, heartfelt thanks to all of YOU for supporting us in this wonderful cause! we MUST sell AT LEAST 100 tickets for the raffle to take place. You can purchase your tickets at Garden Supply Co. The car is also here for folks to come take a look. Checks will be held until AT LEAST 100 tickets are sold and a raffle winner is drawn. Hurry in as we are only offering 100 tickets! And thanks again to everyone for a wonderful evening in the garden! Cary, NC Spring has sprung down at Garden Supply Company. Throughout the garden center you'll find beautiful, fresh flowering perennials, annuals, shrubs and trees. 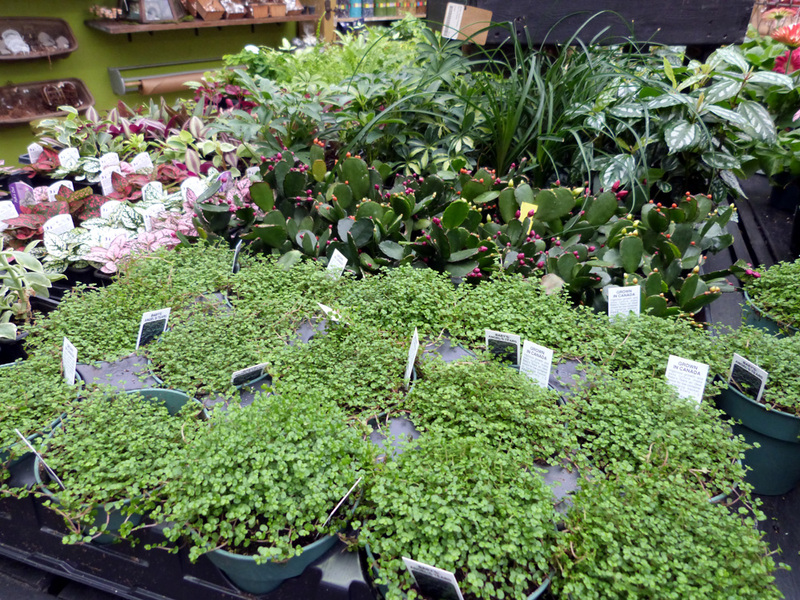 And for all you herb and vegetables gardeners out there, we've got a huge selection of new plants just for you. Also in stock are eversweet, everbearer strawberries, in both baskets and smaller pots. Now's a great time to start your herb and vegetable garden! Our experts are on hand seven days a week to help. Hope to see you soon. Cary, NC Pansies have arrived at Garden Supply Company, and we have a huge selection of beautiful plants to chose from. Best known as one of the most popular cool weather annuals, these lightly scented flowers are available in a huge range of colors. Many have unique markings as well. The dark centers in some flowers are thought to resemble little faces. Equally lovely grown in pots or as mass plantings, pansies have never gone out of fashion. And although delicate, they are surprisingly hardy and will bloom throughout the upcoming winter months and well into spring next year. As compact, low growers, pansies are ideal for edging in beds. Their bright and showy faces add a burst of much-appreciated color in the landscape, boosting curb-appeal throughout the cooler months ahead when nothing else is blooming. We have a huge selection of colors and sizes, from the most popular tried and true choices to new varieties on the market this year. If you're looking for suggestions on where to start, check out these tips from our helpful experts. For planting beds, Garden Supply co-owner, Deborah recommends Blue-ti-ful Blue pansy in combo with Creeping Jenny. Deb's favorite choice for container plantings is Dynamite Wine Flash. The wine-colored blooms look lovely mixed with earth-tones, yet work equally well in many colored containers, as well. Co-owner Keith loves the combination of yellow blotch and pure yellow pansies in contrast with ornamental peppers for a high-impact punch. No matter what your favorite color choice is, we have the perfect pansy for you. Come ask us for suggestions for creating the right combination for your landscape, or let one of our staff members pot up a beautiful container for you. Thanks for stopping by! We'll see you back here soon for more snippets from the garden. Good morning everyone! Yesterday I shared with you some of the beautiful autumn mums we've received this week at the Garden Center. Mums are, without a doubt, one of our most popular fall bloomers. They look equally great in containers on your front porch as in borders in your mixed beds, and come in a rainbow of autumn colors. The garden mum just cannot be beaten for beautiful fall color. And now that you've picked up a few mums for your yard, I have a few tips and tricks for keeping your new plants looking in tip-top shape. Fall planted mums need a little attention to help them make it in the landscape through the winter. Get these fall-blooming perennials in the ground as soon as possible. If using mums as container plants, it’s unlikely they will make it through winter, so enjoy their seasonal color as you would annuals. Plant mums in full sun, in well-drained soil that is moderately moist. If the soil is too wet or too dry, the mums will suffer. Keeping the soil moist will ensure good root development on the plants as they go into winter, even after the tops have gone dormant. They tolerate part shade, but if it is too shady, the mums will get leggy and have smaller flowers. If your area receives at least half a day of sun, your plants should do fine. Plant the mums in your flower bed at the same depth that they were growing in their pots and mulch them to help stabilize soil moisture and temperature. Be sure to cut and loosen the outer root system of the plant to maximize root growth before planting. Do not plant chrysanthemum flowers near street lights or night lights: the artificial lighting may wreak havoc with the mums' cycle. Do not fertilize your plants until you see new growth next spring. Use a general purpose fertilizer such as 5-10-5 at the rate of 1 lb. per 100 square feet. Fertilize once per month through July. Removing the spent flowers, called deadheading, will keep your plant looking neat and tidy and will help promote more blooms. Once your plant has gone dormant, do not cut back the dead growth. The dried flowers and stems serve as insulation to protect the plant during winter. When you see new growth in spring, cut the dead stems as close to the ground as possible. Be sure to give your mums plenty of space in the garden. They can grow and multiply rather quickly. An added benefit, in my opinion. By every third spring, divide your mums to rejuvenate them. With these care tips, you'll be enjoying glorious fall color from your garden mums for years to come. Enjoy! Isn't it refreshing to feel the slight crisp edge to the air these last few mornings? The nights are coming earlier in the evenings, too, and the temperatures are definitely beginning to drop. Seems that fall is truly in the air. And if you stop by the Garden Center, you will find signs of autumn everywhere. The Greenhouse is filled to bursting with gorgeous seasonal decor and gift items, and new plants are arriving daily, just in time for your fall planting. Just this week, we've received a shipment of some of our most popular autumn bloomers, Mums, in all your favorite seasonal colors. From sunny, golden yellow, to orange, to deep red, to raspberry and violet, we have a shade for every taste. We are proud to offer lush and full 8" pots of the following varieties. This year we are also bringing you several choices from the Igloo series of mums, 'Cool Igloo' and 'Rosy Igloo'. The Igloo series is a new, mum like perennial that blooms for weeks in summer and fall without pinching back. This mum is in the Dendranthema plant group, which is looks a lot like members of the Chrysanthemum family. Dendranthema is truly hardy and makes it through winter as smoothly as other perennials in the garden. Mums look fabulous in container gardens on your front porch and deck, mixed in with your fall decor, as the centerpiece for your table settings, or planted in your borders and beds. Stop on by Garden Supply to see these, and all our gorgeous new plant arrivals. And be sure to come on back here tomorrow when I'll be sharing tips on caring for your newly purchased, fall-blooming mums. Hello everyone, and happy Wednesday to you! Today I have a few fun home decor and gift items to share with you that are perfect for all you Do-It-Yourself folks out there. If you are looking for that personalized touch to add to your homes or that special one-of-a-kind gift idea,we've got you covered. And if you haven't been into the Greenhouse lately, do stop by. We've got new goodies arriving daily that you won't want to miss. Like these adorable scarecrow kits that will add a charming touch to your harvest decor. Young and old alike are going to love these metal gourd kits. Simply insert the pieces as you like into a pumpkin or gourd, creating a smiling face in no time. This kit can be reused year after year, and works equally well in real or faux pumpkins. Doesn't this scarecrow look adorable in the planting basket with a touch of recycled paper as a ruff? And if you like this guy, you'll love the turkey kit, too. The turkey kit comes complete with metal head, feet, and tail-feathers to make one adorable, re-usable turkey decoration every year. Another wonderful do-it-yourself project in the Greenhouse right now is the Remake It wine cork trivet. Recycle your old wine corks into a trivet with this easy kit. Simply twist your corks onto the metal trivet, and you are done. It's as simple as that. What a perfect way to showcase corks from your travels or special gatherings and occasions. Makes a fabulous gift for the wine enthusiast on your list. And, it's a great way to recycle, as well. If you're looking for truly personalized artwork, take a look. You can spell any name, word, or phrase with these mix and match alphabets and create your very own one-of-a-kind personalized masterpiece. Each letter of the alphabet is represented with a unique black and white photo using architectural elements for the font. We have 3, 4, 5, 6, or more celled frames to help you create the perfect art piece. Thanks so much for stopping by today! Hope to see you all soon down at Garden Supply. Hello everyone and happy Thursday to you! Today I am excited to share a really beautiful and easy to grow plant with you all, the caladium. The caladium originated in the Amazon jungles of South America. It is a summer bulb (tuber) that will thrive in hot temperatures like ours, and it's gorgeous heart-shaped leaves of red, white, pink, and green will paint your garden in color until the first cold nights. Caladiums offer a fabulous way to insert color and beauty without the use of flowers, providing continuous interest in the landscape well beyond a limited blooming period. Caladiums are easy to plant and are wonderful as a ground cover or border, or in pots, hanging baskets and planters on your deck and inside your home. Mix several varieties in your landscaping for a colorful contrast. Look at some of the gorgeous arrangements of caladiums you'll find down at Garden Supply. Caladiums can be grown as annuals, or may be over-wintered as tender bulbs. Remember that they are a hot-weather, summer bulb. The bulb will be damaged, causing dwarfed leaves, if the temperatures reach below 60 degrees for a prolonged period of time. Lightly fertilize every six weeks with the fertilizer you normally use (or 6-6-6 slow release fertilizer). In the fall, let the leaves die back, then before the first freeze, dig up the bulbs, leaving the leaves on. Store in mesh or paper bags between 65-70 degrees Fahrenheit. Or better yet, bring your potted caladiums indoors during the cooler months and enjoy their colorful foliage as houseplants. You'll not be sorry! Caladiums make a wonderful addition for floral arrangements, too. Cut leaves will keep indoors for 2-3 weeks and are odorless and non-allergenic. Leaves should be soaked for 24 hours before using in arrangements. Thanks so much for stopping by! I hope I've piqued your interest for adding color and interest in your homes and landscape through the use of bright and unusual foliage. And join me back here soon for more snippets from the garden. Come take a walk with me through the Greenhouse. There are LOTS of new goodies arriving daily that will brighten your homes, celebrate the upcoming change of season, and put you in the mood for a little holiday fun. I've brought my camera along. Let's see what's new together. This is just the beginning of the new treasures to see down at Garden Supply. If you're in the area, stop in and say hello. We'd love a visit from you. Remember, also, we would be happy to mail you a goody or two from the Greenhouse if you can't make it in soon. Thanks so much for dropping by today! I'll be back before long with more snippets from the garden. Hi everyone and happy Wednesday to you all! I've just come from Garden Supply where I toured the Greenhouse to peek at all the new goodies that have been arriving for Fall and Halloween. And of course I brought my camera. So how would you like to take a little tour with me? We can see what's new together. Good evening everyone and happy Monday to you! I hope your weeks are off to a wonderful start. We have a couple of special deals going on this week at Garden Supply that I am excited to share with you. It's hot outside, that's true, and gardening might not be tops on your to-do list right now, but these deals are too good to miss! First off, Keith was able to find a fabulous deal on B-Grade mulch that we are happy to be able to pass along to you, our treasured customers. If you are needing to mulch your large natural areas or playgrounds, this is the special for you. Now thru August 15th you can get this mulch for just $10 per yard. And to make it even "sweeter",we are offering free delivery in Cary, Apex, and Morrisville. ($20.00 delivery elsewhere). Now that's a deal! Another deal you won't want to miss is our 50% markdown on all last minute summer annuals. Freshen up your bedding areas and container gardens with a pop of bright color that will last until fall, and enjoy spectacular savings. We still have lots of fresh and beautiful plants to choose from. And for those of you who may have missed out on our Gardener's For the Cure drive earlier this summer, it's not too late to get in on the great deal we have going. We are still offering a 12% discount card good on ALL purchases at Garden Supply through the end of the year for every $100 or more donation made to the Komen Foundation. We also have our adorable team tees available for $10. In other news, Fall and Halloween decor items are arriving daily to the Greenhouse. Come check them out because these goodies tend to head out the door about as quickly as they come in. Thanks so much for stopping by everyone! Hope to see you all soon! Hi everyone and happy Saturday to you! Time sure flies by quickly, does it not? Here we are at the last day of July already. Soon school will be starting up again for those on the traditional calendar, and thoughts will begin to turn towards cooler fall days and everything that goes along with them. But for today.......things are still hot, hot, hot. So why not chill out with the refreshing sound of water and enjoy special savings at the same time? Today is the last day to beat the heat and enjoy 20% off on all water fountains and features down at Garden Supply. We have small table-top versions and large landscape designs, too, perfect for cooling down those hot summer days with the sound of running water. We offer delivery and installation for your new water fountain, too. And if you're thinking of going bigger, we offer delivery and installation on pond and waterfall features, too. Come on down and check us out! Thanks so much for stopping by today! Hope you all have a wonderful weekend, and we're looking forward to seeing you at Garden Supply. Hello everyone and happy Sunday! Hope you all are having a wonderful weekend! I'm back today to share more of the beautiful blooming plants we have waiting for you down at Garden Supply. If you're thinking that your patio and container gardens could use a little pick-me-up in this intense July heat, we have plants for you. And lots of them. Even in the full heat of summer, we are receiving fresh shipments of bloomers every week that are just perfect for adding a spark of interest to the tired summer landscape. Just look at the burst of color this tropical pink mandevilla vine adds to a simple container planting. They really are easy to care for, and add color wherever they are growing. This sunny tropical really enjoys sun....and we all know we have plenty of that these days. Another great choice for the patio garden is the ever-popular Wave petunia, and we have some fabulous choices in stock at the garden center right now. Anyone interested in a little "Double Wave"? of spreading petunias? Double Wave petunias offer fabulous, frilly flowers with Wave performance perfect for mixed containers, baskets and gardens. Look for these lovely flowers in white, purple, and blue velvet varieties at the garden center. Another petunia that really caught my eye this week is this unusual Black Velvet variety. Black Velvet presents the world’s only black petunia. It is a perfect fit for premium containers and baskets as this petunia partners well with many other sun lovers, and the rare color form is sure to add a ton of visual interest to the garden. These upright, mounded petunias are early to flower, have a tightly branched habit and are filled with color all season. Black Velvet is easy to grow with no special culture needed. And don't forget........if you have considered adding a fountain or pond to your landscape, this is a great time. From now, until the end of the month, ALL fountains and pond-building supplies are 20% OFF. We have a wide array of fountains from “table-top” styles to grand statements. We offer delivery and installation of fountains as well as design and installation of ponds and waterfalls. Come check out our fabulous selection. Thanks so much for stopping by! We look forward to seeing you soon down at Garden Supply!